Courtney Greenley (‘11, Environmental Studies and Political Science) is a Strategic Communications ORISE Fellow at the U.S. Army Corps of Engineers Institute for Water Resources. Courtney specializes in water resources management, risk communication, and conflict resolution practices. She focuses her research on current and future communication challenges which require innovative solutions for water resource infrastructure engineering and environmental projects. During her study abroad experience at Luther College, she conducted an independent assessment on the future implications of water scarcity in the Tarangire National Park of Tanzania. Courtney credits her field experience and unique combination of majors for propelling her into a career path centered on water resources policy. 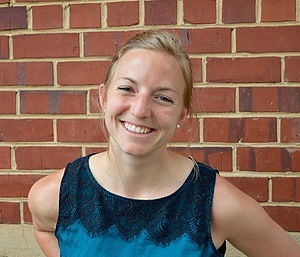 Courtney earned her Master’s in Global Environmental Policy from American University with a concentration in International Peace Building and Conflict Resolution. Audrey Tran Lam ('13, Environmental Studies and Sociology) completed two terms of service as Logistics Coordinator with Green Iowa--a state and national AmeriCorps program that focuses on making Iowans more energy efficient through home energy audits and weatherizations, community outreach, and energy education. 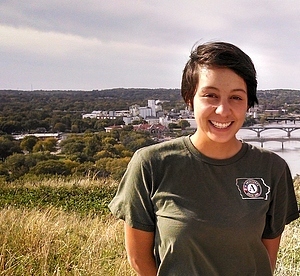 Through her service, she was awarded Iowa AmeriCorps Member of the Month in June 2015. Audrey is currently enrolled at the University of Iowa pursuing a Masters of Public Health where she hopes to further understand the relationship between human health and environmental health. David McKay ('09, Political Science and Environmental Studies) is an Oak Ridge Institute for Science and Education fellow with the U.S. EPA in Washington, DC. At the EPA, he is part of the Water Infrastructure and Resiliency Finance Center, which helps communities make informed decisions for financing drinking water, wastewater, and stormwater projects and seeks to increase the country's infrastructure investment by promoting innovative financing strategies. David has long admired the EPA's work to protect clean air and water, so it is a pleasure to contribute to that mission. 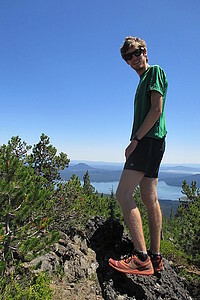 Prior to the EPA, he studied public administration and environmental policy at the University of Oregon. A highlight of grad school was an internship in the Oregon Governor's Office developing state policy for energy efficiency and renewable energy. 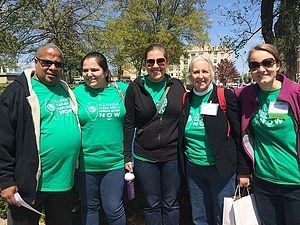 Callie Mabry ('14, Environmental Studies and History, on right in the photo at the Illinois State Capitol) spent a year as a member of the Lutheran Volunteer Corps in Chicago and is returning for a second year of service. Through this program, she works at Faith in Place, a non-profit organization that inspires people of diverse faiths to care for the Earth. Callie helps the organization educate and connect with people of faith and mobilize them to action through emails, newsletters, website content updates, and social media posts. She also coordinates a Winter Farmers Market program with local farmers and vendors from November through March. Sheri Schwert ('17, Environmental Studies and Chemistry) is a water quality monitoring field researcher with the Illinois State Water Survey. 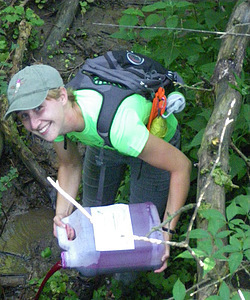 She is responsible for field water sampling and processing across central and southern Illinois. Several experiences led Sheri to this job. A January term course on the Ecology of the Southwest raised many questions about water - the effects of copper mines on water availability and quality, the diversion of Colorado River water to western cities - and developed Sheri's interests in water chemistry. While a student at Luther College, Sherihad a summer internship at the Illinois Sustainable Technology Center. The next summer, she conducted research at Luther College tracing the connections between sinkholes and springs in NE Iowa. Francisco de Jesus Neto ('14, Environmental Studies, pictured at left with the crocodile management team), put his policy concentration immediately to work after graduating from Luther. He is working on the national biodiversity strategy for Timor-Leste (East Timor), with funding from the United Nations and the Global Environment Facility (GEF). He coordinates work with international consultants, government officials, and non-governmental organizations, and contributed a case study on the benefits of traditional knowledge (Tara-Bandu) in forest conservation. 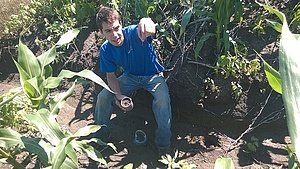 Karl Gesch ('12, Environmental Studies) earned a masters in soil science at Iowa State University, where he researched soil erosion and worked on the Iowa Daily Erosion Project. He then worked as a research technician and developed GIS tools to analyze satellite data. 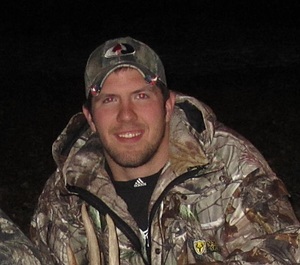 Karl is currently a watershed coordinator and resource management specialist with the Environmental Programs & Services group at the Iowa Soybean Association, where he assists on diverse agricultural conservation projects ranging from watershed planning to providing technical service to farmers. 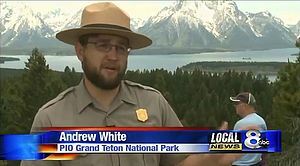 The first position that Andrew White (’11, Environmental Studies and Spanish) held after Luther was as a seasonal park ranger at Grand Teton National Park in Wyoming. Now, he is the Assistant Public Affairs Officer, working with news media to keep the public informed about park incidents and initiatives. He manages the park's social media and Freedom of Information Act programs to engage the public with the management of the park and increase its understanding and appreciation of the park's resources and values. Bobby Kuennen (‘10, Geoscience emphasis) is currently a Senior Environmental Specialist – Project Coordinator with the Iowa Department of Agriculture’s Mines and Minerals Bureau. The southeast part of Iowa has a rich history of coal mining with over 300 sites totaling 13,000+ acres of just surface coal mines. He leads construction projects with a goal to reclaim hazardous coal mining features that were left behind from the strip mining process. The features the Mines and Minerals Bureau is abating include vertical high walls, barren spoil piles, eroding stream channels and deep pit ponds with acidic water.